Location: On the Colorado River in Burnet & Llano Counties. The Llano River intersects with the Colorado River in Kingsland and flows downstream through Lake LBJ providing water and recreational opportunities to the communities of Kingsland, Granite Shoals, Highland Haven, Sunrise Beach, Blue Lake, Dear Haven, Oak Ridge, Horseshoe Bay and Cottonwood Shores. Major Feature: Largest constant level lake in the US and home to Horseshoe Bay Resort, Conference Center and Marriott Resort Hotel. The most impressive vacation rental facilities to be found anywhere in the state of Texas. Our 30 fully equipped Log Cabins & Homes, located on the Colorado Arm of Lake LBJ, are ideal for anyone looking for a corporate retreat, family reunion or a romantic getaway. Nature trails, wildflowers, clear water, covered porches and all the creature comforts make "Log Country Cove" the premier vacation getaway destination in the Texas Hill Country. 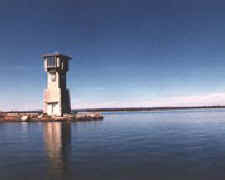 All Cabins are located on the water of beautiful Lake LBJ. There are two main public ramps on the lake. The first ramp (Cottonwood) is operated by the LCRA and is located at the dam off FM 2147. This is a good concrete one-lane boat ramp with a parking lot for 20-30 boats and trailers. Launching is free. 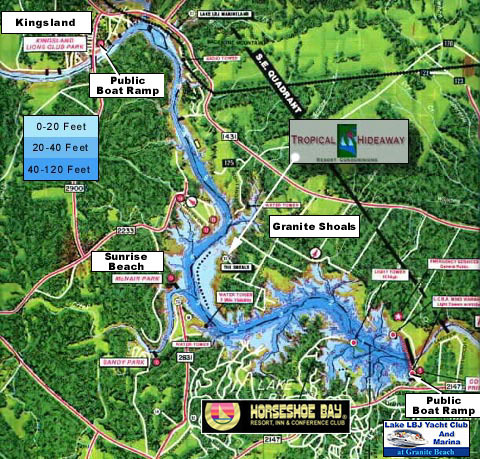 The second ramp is in the town of Kingsland, located off FM 1431 on the north side of the lake in the Llano River arm. This is a one-lane concrete ramp operated by the Lions Club. A fee is charged for launching. In addition, there are several small public ramps in the town of Granite Shoals. 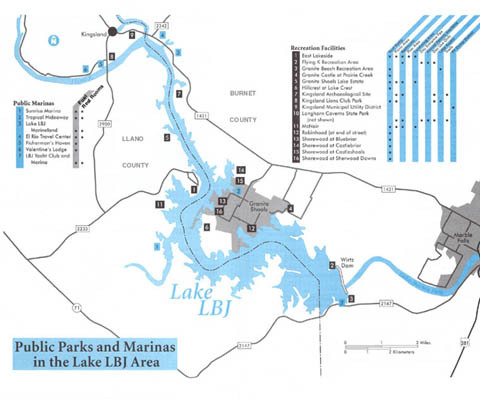 See Map of Public Parks and Marinas in Lake LBJ area. Inks Lake State Park and Longhorn Caverns State Park offer camping, and are just a short drive from the lake. Because of the popularity of these parks, it is a good idea to make reservations well in advance. 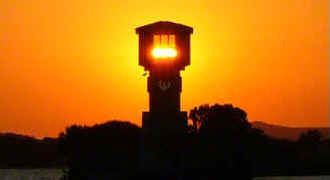 Camping is also available at a number of private campgrounds around Lake LBJ. The LCRA (512) 473-4083 offers a good map of the lake. 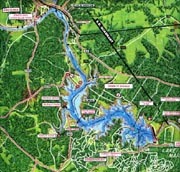 Commercial maps are available at tackle and sporting goods stores. All fish are currently regulated under statewide regulations, with the exception of white bass, which has a 12-inch minumum length limit. The 12 inch minimum for white bass is designed to protect females from harvest before they reach sexual maturity. Lake LBJ Yacht Club & Marina is the finest, most accessible Marina in the Highland Lakes. Make your Slip reservations now at this new "State of the Art", full service facility. Imagine using your boat everyday of the year. The water at Lake LBJ is fine and always deep. Come on in. The prettiest marina in Texas is on the level (Wow! A constant one-foot Lake levels variance). Come have fun with us boat lovers. Book a demonstration of latest "Sea Ray or other Fine Boats". Join us! Rent a boat for a mini tour of Lake LBJ!